•Durable polyethylene construction that is super strong and super stable. •Sturdy handle & graceful curves make it a beautiful addition to any pool. •Removable ballast keeps step in place. Allows for easy winter put away w/out sandbags. •Available outside ladder for non deck applications. •Available mood light in white or new LED options. 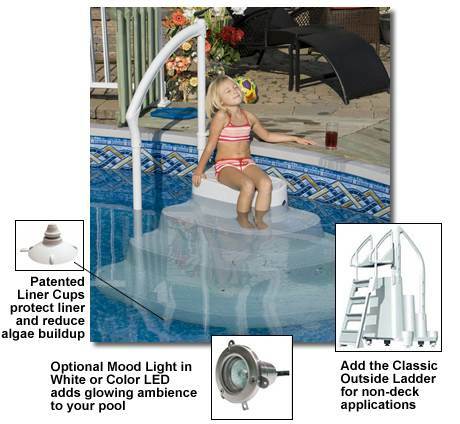 •Measures 58”wide x 44” deep x 43 ½: high to fit any above ground pool 48”-54” deep.